minute, and take a look at the following information. Lavender is great because it is antibiotic, antiviral, antifungal and antibacterial. Combine ammonia, washing soda and ONE CUP warm water in a 1/2 gallon jug. Cap and shake well to mix. Add remaining water. Label the container. Makes 1/2 gallon of CONCENTRATE. To use, mix 1/2 cup of the concentrated cleaner with 1 & 1/2 gallons hot water. Mix together and wash your walls. No rinsing is required. Store in a spray bottle. This is comparable to the "Fantastic" cleaner. marble, wood counter tops, butcher blocks, brass and gold plated items. use as you would Windex. Great for cleaning windows, chrome and bath fixtures. 2 minutes, then rinse well. USE ONLY ON COLORFAST ITEMS. Spray the tile and bathtub area evenly and wipe off with a damp sponge. household ammonia. Allow to set for two hours before scrubbing. Mix; boil in the aluminum pot for 10 minutes. Scour lightly if needed. business letter. Fold each in half as though closing the cover of a book. minutes to absorb all of the liquid. Stack in a lidded plastic container or zip-lock type bag. These are also great for melting windshield ice in cold weather! Mix soap flakes and baking soda in a large bucket. Add water and stir until soap flakes dissolve. Start washing from the top down. Wash one section at a time, then rinse. Wash the wheels last. Soak a large piece of flannel in this solution for several minutes. Wring out and hang to dry. Store in a covered glass or plastic container. Once washed, treat again. Mix well in a bucket. Wash concrete; rinse with clear water and allow to dry. For tough stains, allow the mixture to set for 15 minutes before rinsing. Pour into a pot to cover shower head. Soak for 1 hour. Fill a spray bottle with vinegar and add salt. Spray solution liberally on copper or brass. Let set for a while, then simply rub clean. Heat water to the boiling point, then lower heat to simmer. Slowly add soap flakes and stir gently. Combine neat's-foot oil and beeswax or paraffin in the top of a double boiler. Heat until melted, then stir. Turn heat off and slowly add oil and wax mixture to the soap solution. Stir until thick. Pour into containers and cool. To use, apply with a damp sponge over leather surface. Mix ingredients and dab on the stained area. Leave on for up to 1 hour, then rinse off. CAUTION: Fumes from this cleaner may seem strong, so work in a well-ventilated area. Do not make this recipe in a larger quantity as it will not keep. Also the two chemicals generate heat if left together for long. Pour bleach and water into a clean gallon-size plastic jug. Label, cap, and keep out of the reach of children. under the rim with a toilet bowl brush. Flush. Mix, then pour down the drain. Let foam. Follow with 2 quarts boiling water. nice, and so is saving money. Your current choice for cheap cleaning is toxic chemicals or expensive "eco-friendly" products. How about a 3rd choice that uses reusable packaging such as plastic spray bottles and more often than not costs less than 5% of the commercial equivalent. I am starting to clean with natural products. This saves money and improves the quality of my homes air and reduces my exposure to toxic chemicals. Most of my recipes come from "The naturally clean home"
I won't give too many away from the book as that won't be fair to the author, but have included some samples here. The ones I found on free blogs/etc are on there. I'd like to say that in the spirit of being frugal you can find many, if not all, recipes online. But if you can spare the $7 I think the book is a good buy. The book has tons of recipes for pretty much anything you can image from degreasing to window cleaning. Other tips I have amassed from blogs or relatives, etc. Note: Lime essential oil can be used in place of lemon where noted if you prefer it. -both places are about the same price. Alternatively you could go to the dollar store and buy a cheap cheese grater and grate your own. Please be aware that MOST SOAPS AREN'T ACTUAL SOAP. They are detergent bars and not real soap! So if you grate your own you need to make sure it is natural soap. If you want a mass produced soap that is as close to an "all natural" premium product as possible then buy plain unscented "ivory" brand soap. Grate it yourself and you can save some money. I would assume you can get this at costco. I personally plan to grate ivory soap with a dollar store cheese grater. baking soda - laundry aisle at target/walmart etc. Arm & Hammer brand. Use with a plastic spray bottle. Note: Vinegar is a natural indoor deodorizer and you should not notice any vinegar smell in the air after about 4 minutes. Combine hot water with the ingredients in a spray bottle and shake until the washing soda dissolves. Shake before each use. Mix in a glass jar. Use a soft rag to wipe onto wood surfaces. combine ingredients. Remove from heat and let liquid partially cool. Add essential oil and stir. Pour into clean plastic squeeze bottles with a funnel. Fill your rinsing agent reservoir with white vinegar. store in sealed container such as a bucket. 1.5 to 2 tablespoons per dish load. top of the baking soda you just put in there. Let mixture sit overnight. YOu can use a bit of dish soap on a wet sponge when you clean it the next morning. Don't skimp on the baking soda. Make sure it is completely covered. sponge to wipe the interior of the oven. *NCH* Your basic Laundry detergent powder. you keep in the bucket or just use the one that came with your other detergent. In NCH there are good recipes for sports clothing, fabric softener, pre-stain treatment ETC. I recommend this book! For a simple liquid soap that uses bar-soap as a base, grate one full-size bar of ivory soap and add it to 1 cup of boiling water [or herbal tea]. Add this mixture to a blender and whip it until the soap has disintegrated completely. Next add 1 tablespoon of honey and 1 teaspoon of glycerin to the mixture and blend it again thoroughly. Now add enough water to the mixture to bring it up to the six-cup mark and allow the mixture to cool, occasionally mixing it in the blender. When the mixture has cooled and is thoroughly blended, pour it into a bottle with a pump top. This recipe I found at http://frugalgranola.blogspot.com/2009/02/homemade-liquid-hand-soap.html I didn't record the other sources for the other tips/recipes or I would credit them. Just a mall ninja at heart. This pages does a pretty good explanation... bottom line is one is a petroleum and chemical based product and the other is not. Ah thank you very much. It makes more sense now. We've been making and using our own soaps and cleaning supplies for several years and have zero complaints. Our biggest used by far is vinegar. We use it diluted for cleaning glass, countertops, stains, and in the rinse water for laundry to soften clothes. (the smell disappears when dry) We make furniture polish from lemon juice and olive or vegetable oil. It works GREAT, but we sometimes have a problem with the dogs wanting to lick things after we're done polishing, lol. My wife makes one giant batch of soap a year, all from lye, though she adds oils for scents. Last years batch was two kinds, chocolate and tangerine oak moss. She makes enough at once to last us more than a year, and have pleny to give away. She also makes our deodorant, with the main ingredient being coconut oil in a solid form. We have friends and family collect empty push-up sytle empty sticks, and fill them with our mix. The only problem with it is it tends to get soft when it's hot. (we don't have a/c) Like some other's we've tried, we never have to reapply this during the day. We make all of this for several reasons. 1-we save money. 2-we're putting less trash in the landfill. 3-we're dumping less toxic chemicals into our septic system and ultimately the water supply. 4-we store all the ingredients to make everything, so we never have to worry about needing anything, and 4-we're putting less chemicals on our body. I was never happy about rubbing aluminum and antifreeze under my arm, so this eliminates that totally. My wife is in bed with a migrane or I would ask where her little recipe book is. When I get it, I can post those that we use if anyone is interested. My wife is in bed with a migraine or I would ask where her little recipe book is. When I get it, I can post those that we use if anyone is interested. Please please please! I can host it if needed. Mix soda and starch together, then add in 4 t of the coconut oil. You want it to mix to the consistancy of play-dough. (Add the other t of oil if necessary) You can add 10 drops of any scented oil you like, we use patchouli. Mash into clean pushup containers and use the same as store-bought. As I said origionally, if you live in an area that gets hot, this stuff WILL soften when it gets warm. The kids think it's nasty, but we keep it in the fridge when it starts to get soft. Grate bar soap as fine as you can. I know some people use a food processor just for this, but we use a plain old square grater. Put grated soap, Borax, ans soda in a bucket and add the hot water. Let it sit for s short time till all the soap dissolves, mix thouroghly, and put in containers. We only use a tablespoon of this for regular loads, but add more for heavily soiled clothes. This stuff will tend to clump up a bit when sitting, but just shake your bottle or container before use to re-mix it. Somtimes finding all these ingredients can be a challenge, and we've yet to find one place that carries them all, unless we head towards the Amish areas south of us. We just do the same as any prep item, and get 4 at a time when we are low. We generally make a double batch, and fill empty detergent containers that the kids and family save for us. Thanks for the recipes. Any links, blogs or books that you've found useful, are more than welcome. I'm trying to save a bit of time on the research, web-navigation given I'm a newbie with this. Thanks again to all for the useful info. a quick google search "DIY cleaning recipies" turns up tons of hits. I had to make this sticky... I spent too much time looking for it this morning! Hope it is helpful to others as well. I love all the useful information ya'll have posted! Thank you! I am very interested in making my own cleaning supplies to save money and have fewer chemicals in my home. 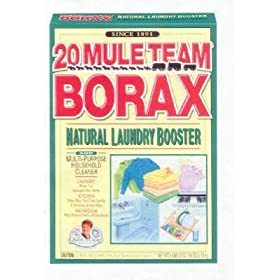 I just have a question about borax. How toxic is it? For example, if my toddler happened to get into it, how bad would it be? I often refer back to this thread... so much good information. I realize that it's been a while since anyone posted in this thread, so I'm resurrecting it for a moment. As far as natural cleaners go, that's what I use. I did have a problem with getting the soap scum and hard water stains off the glass shower walls. I needed something "rough" to scrub them clean without scrubbing for hours to get it all off. I mixed baking soda and salt, then added just a bit of water to make a thick paste. The salt scrubbed it right off and the baking soda cleaned it. Minimal scrubbing. I just rubbed it on the glass walls and the hard water stains came right off the the mix rinsed off quite easily. I've got an update. Having made my own laundry detergent now I find that the recipes being by volume in the book makes it hard to make a lot at the time. It is much easier to do it by weight. Having measured out everything here is my revised recipe for laundry detergent. Great help! Thanks for the info. Only thing I could add is the microfiber cleaning cloths they are incredible. At the cheapy stores they are cheap now. I can clean the car with just a bottle or water and two microfiber rags if it's not thick dirt or mud. and it will look super. Just wet one rag and wipe it down dry with the other. Also on windows inside and out, use water (dip it then wring it, not much water) on one microfiber cleaning cloth and then dry with the other. It will strip dirt and grime off like you have never seen. Even works on microwave insides and fridge insides, even when it's gross. If it's super bad grease you might need some help from a cleaning agent of your chosing. And you can reuse the microfiber just wash them in the washing machine but DO NOT use fabric softener or it will ruin them. With microfiber I can get some stuff very clean with no chemicals at all but water. I'm wondering, after reading Jeffrey Tucker's article, if the addition of TSP (trisodium phosphate) to the home mix would increase cleaning power... anyone tried it? I'm going to pick up a 5 lb box of it on my next trip to Home Depot to try on my homemade dishwashing powder and my laundry soap. This will develop "clumps" on the top as it sits between use, but just shake the container to mix before you use it. Dawgus, that sounds like a manageable amount. I've not wanted to mix up the larger quantities of liquid at one time that I've seen quoted in other recipes. I'll have to give that one a try. I am thinking I won't try mixing a liquid with the TSP, since I don't know how the chemicals might react. I'll stick to adding it as a powder, unless I hear that someone else can give information about it. For scrubbing things like bathtubs, stovetops, etc. I use a mix of equal parts baking soda, borax, and salt. I add just enough water to make a thick paste, and use a slice of loofah as a scrubber. They make great scouring pads, and when they're past their prime I compost them. Mix and store in a spray bottle. This will clean walls, floors,countertops, upholstery, and carpet. 5 drops each lavender, lemon, and pine essential oils. Put into a spray bottle along with a squirt of liquid Dr. Bronners soap, then fill the rest of the way with distilled water. Cleans general stuff, and smells nice. Use a clean quart mason jar with lid. Fill about half with baking soda, and about half with borax. Make sure to leave about an inch of room at the top so you have room to shake and mix. Add 20 drops lavender essential oil, 20 drops lemon essential oil, and 10 drops rosemary essential oil. Close jar and shake well to distribute EOs. Sprinkle onto carpet, and let sit for 15 minutes to an hour. Vacuum up. Mix half and half cedar shavings and dried lavender. (I just use a handful of each) Stuff into a drawstring pouch or sew into a small pillow. Toss into drawers and closets. Keeps bugs out, and smells nice. A note on essential oils - make sure you're buying true EOs and not synthetics or blends which can start to smell off. I buy my EOs from Mountain Rose herbs, good stuff! OK... all set to try out the addition of TSP to my next load of dishes... I already mix my own dishwashing powder (1/2 borax and 1/2 washing soda). I currently use about 1 tsp. per load. I'm going to try 1/2 tsp of TSP in addition to see what the effect is. I'm going to do a similar experiment on my next load of laundry... adding about 1 tsp (I currently use about 1 T. powdered mix similar to dry laundry soap recipe above). I found TSP in the paint section at Lowe's, back by the turpentine and cleaners. 4 lbs cost about $11.00. A lot of mixes I have seen use Fels and a brand name bath soap. Since we don't buy bath soap (wife makes ours), and I refuse to use it with laundry, we mix Fels and Zoat. Both clean clothes very well, but Fels has a distinctive odor. Zoat is a little more pleasant, but not at all overbearing. Sometimes we also do a 50/50 with Fels and Clarks Castile soap bars,only because Zoat is harder to find in our area. I am a suffer of bad adult acne. I was talking to someone the other day that suggested that the sulfates in modern shampoos etc can irritate the skin. She switched over to cleaning her hair with baking soda exclusively and claims to have beat a much worse case of adult acne than I have currently. Anyone have any experience with this? She said initially her hair was very greasy as her body got rid of the chemical build up. That process lasted about 2 week. Now claims that the hair dresses compliment and gush over how soft and luxurious her hair is.